We raise 100% natural grass fed and finished beef, free roaming chickens and pigs. Our meats are free of drugs, hormones, antibiotics, animal-by-products and corn. We have an online store for you to browse and purchase our tasty meats and gluten-free sausages. 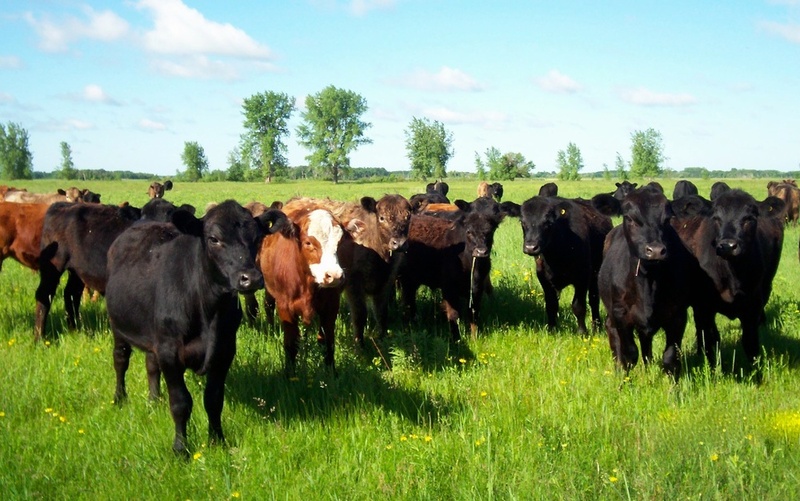 Our Angus-crossed beef cattle have been on a diet of grass and forage legumes (clover, alfalfa) for the past 20 years. Our cattle are born, raised and fed on native grass pastures. It begins in spring, when the calves are born on pastures. The cattle are moved from one pasture to the next ensuring a fresh selection of native grasses and forage legumes. Rotational grazing allows the land to replenish and the cattle provide manure fertilization to nourish the soil. During winter months we feed our cattle baled native grass and forage legumes, which grow in our fields in the summer. We keep our cattle for market 28-36 months to finish, to ensure proper weight gain, nutritional values, quality and flavourful meat. We raise our cattle in the most natural way possible free of hormones, steroids, fertilizers, animal-by-products, antibiotics, corn and soy. According to research, 100% grass fed and finished beef is a good source Vitamins A & E, beta-carotene, Omega-3 fatty acids and CLA (Conjugated linoleic acid). Read more from David Asprey, Mark Sisson and Chris Kresser. Our free roaming chickens are raised outdoors from spring to fall. They spend their days outside and forage in plants, eating insects and grains. The chickens we raise are free of drugs, hormones and antibiotics. Our chickens are reared for 4-5 months, which allows the chicks to grow at a slow and natural rate. They are raised to roam freely in a safe outdoor area where they have access to sunshine, fresh air, plants and bugs. They are free to chicken scratch for grubs in manure left over by the cattle in the winter. Unlike cows they are unable to digest pure grass therefore, in addition they are given a mix of grains and seeds that we mix ourselves. The chicken feed is comprised of barley, field peas (spit peas, black eyed peas, lentils), wheat, oats and minerals/vitamins. “Pastured chickens offers more nutrients such as Omega-3 fatty acid, vitamin E, folic acid and B-12.” Mark Sisson Read more. BERKSHIRE HERITAGE BREED, NATURALLY RAISED. Our Heritage Berkshire and Tamworth pigs are 8 – 10 weeks old when we purchase them from a local farmer who breeds heritage breeds. In late spring we receive a handful of pigs to raise until fall or winter. They are free to be indoors and outside as the barn door is always open to the outdoor spacious pen. Our feed is a combination of barley, oats, field peas kelp and organic garden culls from our vegetable garden. When you order from us, you have our guarantee that your meat is naturally raised on our farm.